This page is about the Jefferson residence. For other uses, see Monticello (disambiguation). Monticello was the primary plantation of Thomas Jefferson, the third President of the United States, who began designing and building Monticello at age 26 after inheriting land from his father. Located just outside Charlottesville, Virginia, in the Piedmont region, the plantation was originally 5,000 acres (20 km2), with Jefferson using slaves for extensive cultivation of tobacco and mixed crops, later shifting from tobacco cultivation to wheat in response to changing markets. The current Nickel (United States coin) features a depiction of Monticello on the reverse. Jefferson designed the main house using neoclassical design principles described by Italian Renaissance architect Andrea Palladio and reworking the design through much of his presidency to include design elements popular in late 18th-century Europe and integrating numerous of his own design solutions. Situated on the summit of an 850-foot (260 m)-high peak in the Southwest Mountains south of the Rivanna Gap, the name Monticello derives from the Italian for "little mount". Along a prominent lane adjacent to the house, Mulberry Row, the plantation came to include numerous outbuildings for specialized functions, e.g., a nailery; quarters for domestic slaves; gardens for flowers, produce, and Jefferson's experiments in plant breeding — along with tobacco fields and mixed crops. Cabins for field slaves were farther from the mansion. At Jefferson's direction, he was buried on the grounds, in an area now designated as the Monticello Cemetery. The cemetery is owned by the Monticello Association, a society of his descendants through Martha Wayles Skelton Jefferson. After Jefferson's death, his daughter Martha Jefferson Randolph sold the property. In 1834 it was bought by Uriah P. Levy, a commodore in the U.S. Navy, who admired Jefferson and spent his own money to preserve the property. His nephew Jefferson Monroe Levy took over the property in 1879; he also invested considerable money to restore and preserve it. In 1923, Monroe Levy sold it to the Thomas Jefferson Foundation (TJF), which operates it as a house museum and educational institution. It has been designated a National Historic Landmark. In 1987 Monticello and the nearby University of Virginia, also designed by Jefferson, were together designated a UNESCO World Heritage Site. Jefferson's home was built to serve as a plantation house, which ultimately took on the architectural form of a villa. It has many architectural antecedents, but Jefferson went beyond them to create something very much his own. He consciously sought to create a new architecture for a new nation. Work began on what historians would subsequently refer to as "the first Monticello" in 1768, on a plantation of 5,000 acres (2,000 hectares). Jefferson moved into the South Pavilion (an outbuilding) in 1770, where his new wife Martha Wayles Skelton joined him in 1772. Jefferson continued work on his original design, but how much was completed is of some dispute. In constructing and later reconstructing his home, Jefferson used both free workers and enslaved laborers. After his wife's death in 1782, Jefferson left Monticello in 1784 to serve as Minister of the United States to France. During his several years in Europe, he had an opportunity to see some of the classical buildings with which he had become acquainted from his reading, as well as to discover the "modern" trends in French architecture that were then fashionable in Paris. His decision to remodel his own home may date from this period. In 1794, following his service as the first U.S. Secretary of State (1790–93), Jefferson began rebuilding his house based on the ideas he had acquired in Europe. The remodeling continued throughout most of his presidency (1801–09). Although generally completed by 1809, Jefferson continued work on the present structure until his death in 1826. Jefferson added a center hallway and a parallel set of rooms to the structure, more than doubling its area. He removed the second full-height story from the original house and replaced it with a mezzanine bedroom floor. The interior is centered on two large rooms, which served as an entrance-hall-museum, where Jefferson displayed his scientific interests, and a music-sitting room. The most dramatic element of the new design was an octagonal dome, which he placed above the west front of the building in place of a second-story portico. The room inside the dome was described by a visitor as "a noble and beautiful apartment," but it was rarely used—perhaps because it was hot in summer and cold in winter, or because it could only be reached by climbing a steep and very narrow flight of stairs. The dome room has now been restored to its appearance during Jefferson's lifetime, with "Mars yellow" walls and a painted green floor. Summertime temperatures are high in the region, with indoor temperatures of around 100 °F (38 °C). Jefferson himself is known to have been interested in Roman and Renaissance texts about ancient temperature-control techniques such as ground-cooled air and heated floors. 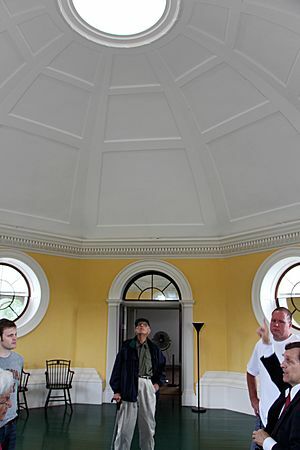 Monticello's large central hall and aligned windows were designed to allow a cooling air-current to pass through the house, and the octagonal cupola draws hot air up and out. Moderate air conditioning, designed to avoid the harm to the house and its contents that would be caused by major modifications and large temperature differentials, was installed in the house, a tourist attraction, in the late twentieth century. Before Jefferson's death, Monticello had begun to show signs of disrepair. The attention Jefferson's university project in Charlottesville demanded, and family problems, diverted his focus. The most important reason for the mansion's deterioration was his accumulating debts. In the last few years of Jefferson's life, much went without repair in Monticello. A witness, Samuel Whitcomb Jr., who visited Jefferson in 1824, thought it run down. He said, "His house is rather old and going to decay; appearances about his yard and hill are rather slovenly. It commands an extensive prospect but it being a misty cloudy day, I could see but little of the surrounding scenery." After Jefferson died on July 4, 1826, his only official surviving daughter, Martha Jefferson Randolph, inherited Monticello. The estate was encumbered with debt and Martha Randolph had financial problems in her own family because of her husband's mental illness. In 1831 she sold Monticello to James Turner Barclay, a local apothecary. Barclay sold it in 1834 to Uriah P. Levy, the first Jewish Commodore (equivalent to today's admiral) in the United States Navy. A fifth-generation American whose family first settled in Savannah, Georgia, Levy greatly admired Jefferson and used his private funds to repair, restore and preserve the house. The Confederate government seized the house as enemy property at the outset of the American Civil War and sold it to Confederate officer Benjamin Franklin Ficklin. Levy's estate recovered the property after the war. Levy's heirs argued over his estate, but their lawsuits were settled in 1879, when Uriah Levy's nephew, Jefferson Monroe Levy, a prominent New York lawyer, real estate and stock speculator (and later member of Congress), bought out the other heirs for $10,050, and took control of Monticello. Like his uncle, Jefferson Levy commissioned repairs, restoration and preservation of the grounds and house, which had been deteriorating seriously while the lawsuits wound their way through the courts in New York and Virginia. Together, the Levys preserved Monticello for nearly 100 years. Monticello depicted on the reverse of the 1953 $2 bill. Note the two "Levy lions" on either side of the entrance. The lions, placed there by Jefferson Levy, were removed in 1923 when the Thomas Jefferson Foundation purchased the house. In 1923, a private non-profit organization, the Thomas Jefferson Foundation, purchased the house from Jefferson Levy with funds raised by Theodore Fred Kuper and others. They managed additional restoration under architects including Fiske Kimball and Milton L. Grigg. Since that time, other restoration has been performed at Monticello. The Foundation operates Monticello and its grounds as a house museum and educational institution. Visitors can wander the grounds, as well as tour rooms in the cellar and ground floor. More expensive tour pass options include sunset hours, as well as tours of the second floor and the third floor including the iconic dome. Monticello is a National Historic Landmark. It is the only private home in the United States to be designated a UNESCO World Heritage Site. Included in that designation are the original grounds and buildings of Jefferson's University of Virginia. From 1989 to 1992, a team of architects from the Historic American Buildings Survey (HABS) of the United States created a collection of measured drawings of Monticello. These drawings are held by the Library of Congress. Among Jefferson's other designs are Poplar Forest, his private retreat near Lynchburg (which he intended for his daughter Maria, who died at age 25); the University of Virginia, and the Virginia State Capitol in Richmond. Much of Monticello's interior decoration reflects the personal ideas and ideals of Jefferson. 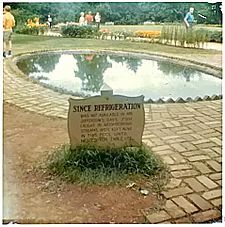 In a time before refrigeration, Jefferson had the pond stocked with fish, to be available on demand. The original main entrance is through the portico on the east front. The ceiling of this portico incorporates a wind plate connected to a weather vane, showing the direction of the wind. A large clock face on the external east-facing wall has only an hour hand since Jefferson thought this was accurate enough for slaves. The clock reflects the time shown on the "Great Clock", designed by Jefferson, in the entrance hall. The entrance hall contains recreations of items collected by Lewis and Clark on the cross-country expedition commissioned by Jefferson to explore the Louisiana Purchase. Jefferson had the floorcloth painted a "true grass green" upon the recommendation of artist Gilbert Stuart, so that Jefferson's "essay in architecture" could invite the spirit of the outdoors into the house. The south wing includes Jefferson's private suite of rooms. The library holds many books from his third library collection. His first library was burned in an accidental plantation fire, and he 'ceded' (or sold) his second library in 1815 to the United States Congress to replace the books lost when the British burned the Capitol in 1814. This second library formed the nucleus of the Library of Congress. As "larger than life" as Monticello seems, the house has approximately 11,000 square feet (1,000 m2) of living space. Jefferson considered much furniture to be a waste of space, so the dining room table was erected only at mealtimes, and beds were built into alcoves cut into thick walls that contain storage space. Jefferson's bed opens to two sides: to his cabinet (study) and to his bedroom (dressing room). The west front (illustration) gives the impression of a villa of modest proportions, with a lower floor disguised in the hillside. The north wing includes two guest bedrooms and the dining room. It has a dumbwaiter incorporated into the fireplace, as well as dumbwaiters (shelved tables on casters) and a pivoting serving door with shelves. Jefferson located one set of his slaves' quarters on Mulberry Row, a one-thousand foot road of slave, service, and industrial structures. Mulberry Row was situated three hundred feet (100 m) south of Monticello, with the slave quarters facing the Jefferson mansion. These slave cabins were occupied by the slaves who worked in the mansion or in Jefferson's manufacturing ventures, and not by those who labored in the fields. Archaeology of the site shows that the rooms of the slave cabins were much larger in the 1770s than in the 1790s. Researchers disagree as to whether this indicates that more slaves were crowded into a smaller spaces, or that fewer people lived in the smaller spaces. Earlier slave houses had a two-room plan, one family per room, with a single, shared doorway to the outside. But from the 1790s on, all rooms/families had independent doorways. Most of the cabins are free-standing, single-room structures. By the time of Jefferson's death, some slave families had labored and lived for four generations at Monticello. Six families and their descendants were featured in the exhibit, Slavery at Jefferson's Monticello: Paradox of Liberty (January to October 2012) at the Smithsonian's National Museum of American History, which also examines Jefferson as slaveholder. Developed as a collaboration between the National Museum of African American History and Culture and Monticello, it is the first exhibit on the national mall to address these issues. 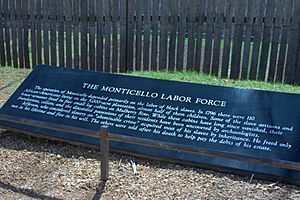 In February 2012, Monticello opened a new outdoor exhibit on its grounds: Landscape of Slavery: Mulberry Row at Monticello, to convey more about the lives of the hundreds of slaves who lived and worked at the plantation. The main house was augmented by small outlying pavilions to the north and south. A row of outbuildings (dairy, a washhouse, store houses, a small nail factory, a joinery etc.) and slave's quarters (log cabins), known as Mulberry Row, lay nearby to the south. A stone weaver's cottage survives, as does the tall chimney of the joinery, and the foundations of other buildings. A cabin on Mulberry Row was, for a time, the home of Sally Hemings, the household slave who is widely believed to have had a 38-year relationship with the widower Jefferson and to have borne six children by him, four of whom survived to adulthood. The genealogist Helen F.M. Leary concluded that "the chain of evidence securely fastens Sally Hemings's children to their father, Thomas Jefferson." Later Hemings lived in a room in the "south dependency" below the main house. On the slope below Mulberry Row, slaves maintained an extensive vegetable garden for Jefferson and the main house. In addition to growing flowers for display and producing crops for eating, Jefferson used the gardens of Monticello for experimenting with different species. The house was the center of a plantation of 5,000 acres (2,000 ha) tended by some 150 slaves. There are also two houses included in the whole. New research, publications and training for guides has been added since 2000, when the Foundation's Research Committee concluded it was highly likely that Jefferson had fathered Sally Hemings' children. Some of Mulberry Row has been designated as archeological sites, where excavations and analysis are revealing much about slave life at the plantation. In the winter of 2000-2001, the slave burial ground at Monticello was discovered. In the fall of 2001, the Thomas Jefferson Foundation held a commemoration of the burial ground, in which the names of known slaves of Monticello were read aloud. Additional archeological work is providing information about African-American burial practices. In 2003 Monticello welcomed a reunion of descendants of Jefferson from both the Wayles' and Hemings' sides of the family. It was organized by the descendants, who have created a new group called the Monticello Community. Additional and larger reunions have been held. In 2004, the trustees acquired Mountaintop Farm (also known locally as Patterson's or Brown's Mountain), the only property that overlooks Monticello. Jefferson had called the taller mountain Montalto. To prevent development of new homes on the site, the trustees spent $15 million to purchase the property. Jefferson had owned it as part of his plantation, but it was sold off after his death. In the 20th-century, its farmhouses were divided into apartments for many University of Virginia students. The officials at Monticello had long considered the property an eyesore, and planned to acquire it when it became available. The house is similar in appearance to Chiswick House, a Neoclassical house inspired by the architect Andrea Palladio built in 1726-9 in London. Monticello was featured in Bob Vila's A&E Network production, Guide to Historic Homes of America, in a tour which included Honeymoon Cottage and the Dome Room, which is open to the public during a limited number of tours each year. In 2014, Prestley Blake constructed a 10,000 square foot replica of Monticello in Somers, Connecticut. It can be seen on Rte 186 also known as Hall Hill Rd. A replica of Monticello was constructed in Chickasha, Oklahoma. The entrance pavilion of the Naval Academy Jewish Chapel at Annapolis is modeled on Monticello. Chamberlin Hall at Wilbraham & Monson Academy in Wilbraham, Massachusetts, built in 1962 and modeled on Monticello, serves as the location of the Academy's Middle School. Completed in August 2015, Dallas Baptist University built one of the largest replicas of Monticello, including its entry halls and a dome room. Approximately 23,000 square feet, it is the home of the Gary Cook School of Leadership, as well as the University Chancellor's offices. 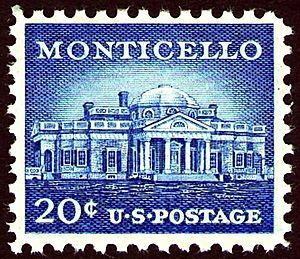 On April 13, 1956, the U.S. Post Office issued a postage stamp honoring Monticello. 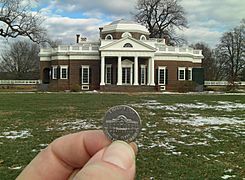 Monticello's image has appeared on U.S. currency and postage stamps. An image of the west front of Monticello by Felix Schlag has been featured on the reverse of the nickel minted since 1938 (with a brief interruption in 2004 and 2005, when designs of the Westward Journey series appeared instead). It was also used as the title for the 2015 play Jefferson's Garden, which centred on his life. Monticello also appeared on the reverse of the two-dollar bill from 1928 to 1966, when the bill was discontinued. The current bill was introduced in 1976 and retains Jefferson's portrait on the obverse but replaced Monticello on the reverse with an engraved modified reproduction of John Trumbull's painting Declaration of Independence. The gift shop at Monticello hands out two-dollar bills as change. Monticello Facts for Kids. Kiddle Encyclopedia.